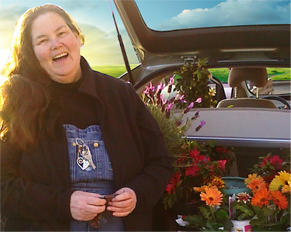 For this week’s Care2 recipe, I’d like to share two recipes from Linda Acosta, the Assistant Manager of the HeartMath Kitchen. These are two delightful, vegetarian recipes! Napa cabbage serves as a base for this refreshing and beautiful coleslaw. 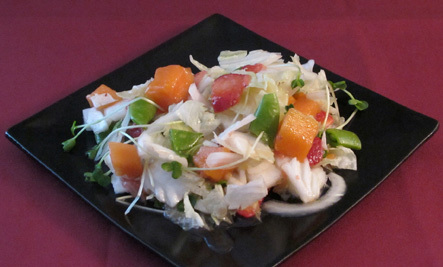 The subtle taste of onion in the dressing gives a great contrast to the fruitiness of the papaya and strawberries. Yum!! 1 cup Daikon sprouts, or use whatever type of sprouts you can find. Combine all dressing ingredients, except oil, in a bowl. Slowly drizzle in the oil as you whisk. Toss cabbage, snap peas, onions and sprouts in a bowl. Toss fruit in a separate bowl with the dressing and set aside. Toss all together in a bigger bowl, about 45 minutes before you plan to serve the salad. This salad has great texture and wonderful flavor, with just a hint of sweetness from the sweet potatos and teriyaki sauce. It’s a whole meal in a bowl!! In a small oiled baking pan, toss tofu cubes with teriyaki sauce. Bake @350◦ for 10 minutes. 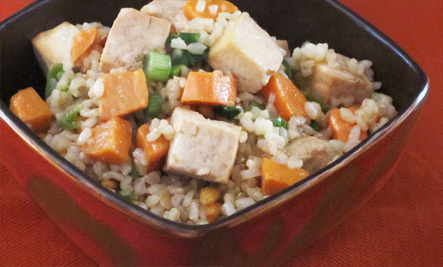 In a medium bowl toss together the cooked rice, sweet potatos, tofu, snap peas, green onions and pine nuts. Set aside. Make dressing with a whisk or with a mixer. Pour dressing over rice mixture and toss gently until everything is well coated. This salad can be served at room temperature or heated slightly. The Maui Slaw sounds really good. I'm not sure where to find Daikon sprouts. I will have to look around for them. Yummy------got to try those, sound delicioussa. Bless you all. sounds delish! looks even better! oh man now i'm hungry! lol thanks! Must try these though I have no idea what Daikon sprouts are. Wow, must try these. Thanks! Sound good. Aren't the Islands wonderful. Just go out to the papaya tree and pick one fresh!